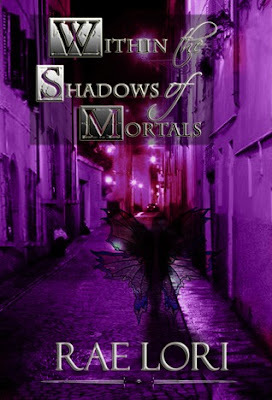 Rae Lori has revealed the cover to Within the Shadows of Mortals (Book 2 in the Ashen Twilight Series) coming February 2010. For centuries, a group of Nightwalkers, Lycans and Shifter Elves have lived within the shadows of mortals to ensure their survival…until an old foe reemerged and brought the realm of the Fae into the mortal world. After the fall of the enemy, a string of events unfolds. Ariya is now an Aziza faerie Queen settling with Jace Archane, a Regent in the House of Blood in the Aziza realm. The houses continue to move West after fighting for their survival against the elemental led by Liam Blakedon, a former guard in the Archane house. Late on the highway leading to California, a massacre breaks out in the darkness of night ending in the death of a Lycan family. Word gets back to Ariya and Jace in the Aziza Fae realm and they return, seeing how much has changed since they took their retreat. Mortals have become aware that Nightwalkers, Lycans and Shifter Elves are alive and well in their city. Worse yet, Rich and his pregnant mate, Joanna, have disappeared on the trip from Arizona to California. As they race to find Rich, before it’s too late, a group of mysterious hunters begin picking off members of the houses, one by one. Ariya knows that Jace is tired of running and hiding after centuries of living within the shadows of mortals. Now, she must choose a path that will force her to decide whether to help her immortal allies or rule the broken kingdom left behind after her parent's death. Soon, she finds that Jace's presence in the Aziza realm brings an ancient evil to life that only lived in fairytales...until now. Jace Archane knows the depths humans will go to destroy the immortals. Tired of hiding and living hidden from mortals, he is ready to rise and fight against their hunters. However, as he gives in to his baser Nightwalker instincts, his relationship with Ariya tenses. Jace may end up losing more than his humanity as he gives into revenge against his mortal enemies. 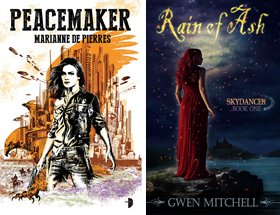 That cover looks a lot like Karen Marie Moning's Faefever. ohhhh - very nice. Thanks for showing us. Anonymous the streetscape has some of the same feel. You're welcome as always Tracey. I liked the first book and am looking forward to this one.